Stunning scenery, historical landmarks and a comfortable, active lifestyle make retirement communities in Washington State the ideal choice for many Baby Boomers in their retirement years. Washington State, known as the Evergreen State, is in the Pacific Northwest of the United States and is considered by many to be one of the most beautiful states in the nation. Majestic mountains, evergreen forests, crystal-clear waters and temperate rainforests meld with sandy ocean beaches, lavender fields and sagebrush deserts for a scenic wonderland of natural beauty. Divided by the Cascade Mountains, Washington has two distinct types of weather. 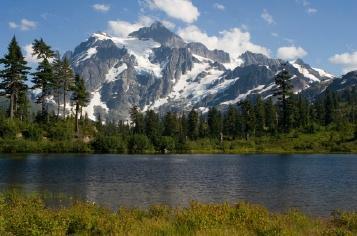 The area east of the Cascade Mountains has hot summers, cold winters and little rainfall. However, on the western side of the mountain range, Washington State has mild weather, very much like that of the Southeastern and mid-Atlantic Coasts. This area is also one of the world's rainiest regions, with some areas along the coast receiving as much as 200 inches of rain a year. Washington is quickly becoming a top choice for many retirees as cities and retirement communities throughout the state receive high rankings in the lists of best places to retire. There are many excellent retirement communities found throughout the state of Washington. The five following areas are a simple way to separate the state geographically. The examples below are only a few of the hundreds of retirement communities in Washington state. One of the most magnificent and beautiful areas of Washington State is the Olympic Peninsula. Also located in this beautiful area of Lacey, Washington is Jubilee at Hawks Prairie for those aged 55 years and older. This active lifestyle retirement community features a 36-hole championship golf course, a spectacular recreation center, indoor and outdoor pools and extensive trails for biking or jogging. The largest city in the United States Pacific Northwest region is Seattle, Washington. Many retirement communities in this area are set in an urban environment. Mirabella Seattle is located in South Lake Union conveniently close to the city's center. Tenants can choose their floor plan as well as which view they'd like to have. Start with either a one bedroom/one bath or a two bedroom/two bath and make further choices from there. Amenities include a health and wellness program, including a fitness and aquatics center with classes. Community dining options include the Lakeside Dining Room, the Courtyard Cafe, the Evergreen Lounge, and the Vineyard Room. Residents have the opportunity to garden in raised garden beds. Various art classes are offered. There's a gym staffed by full-time fitness trainers, and residents can participate in various programs. There are planned social events and outings to nearby attractions. Weekly housekeeping is also available. The El Dorado Adult Living community is in Bellingham, Washington, which is known as the jewel of the Northwest. An active lifestyle retirement community, the El Dorado offers luxury condominiums for easy living in a beautifully landscaped setting. Residents have private garages, a clubhouse, community garden and a putting green. This area of the state is continuously ranked among the Top 10 retirement areas of the country with its excellent air quality, temperate climate and access to sports and cultural activities. Stillwaters Estates offers seniors 50 and over a secure, gated retirement community in Centralia, Washington. Located midway between Portland and Seattle, Stillwaters Estates offers their residents the following activities and amenities. Hawthorne Court, made up of luxurious apartments in Kennewick, Washington, is an active retirement community for the more independent lifestyle. When looking for retirement communities, Washington State offers a variety of accommodations suited for various tastes and budgets, all nestled in the spectacular wonders of nature.